Some rubies sold in department stores as natural stones are actually fused with glass. Imagine spending thousands of dollars on a piece of jewelry only to find out it's not what you paid for. It's happening to consumers across the country, and some experts in the jewelry industry said it's time it stopped. A relatively new category of rubies is being sold as the real deal. You probably aren't aware of them and, as "Good Morning America" found out, neither are some of the people selling them. "GMA" went on an undercover shopping trip at major department stores with Antoinette Matlins, a professional gemologist and author of "Jewelry & Gems: The Buying Guide." In a search for ruby jewelry, we were told time and again that what we were buying were real rubies. "That's a real ruby, oh yes," said one employee at Macy's in Jersey City, N.J. But that wasn't really true. "With gems, what you see with the eye alone does not begin to tell the full story," Matlins said. Throughout history, the rarity of rubies has been celebrated. The centerpiece of the Imperial Crown of India is a ruby. In fact, the finest natural rubies sell for more than the finest colorless diamonds. But "GMA" learned that some companies are selling rubies that aren't entirely natural. They're called composite rubies, a combination of ruby fused together with glass. To the naked eye, there's no difference, but examined under a microscope, gas bubbles that form as the glass cools can be seen in the composite rubies. 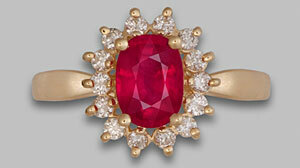 Experts say composite rubies are fragile, and that they're only worth a fraction of the value of natural rubies. "There is a huge addition of glass in this particular product. And while it looks beautiful, extreme care needs to be exercised when you wear them," Matlins said. "GMA" asked if the rubies we were buying needed special care. "This doesn't need special care," a Macy's employee in New York City said. But actually, the wrong care and cleaning can ruin composite rubies. "These are not nearly as durable as a real ruby would be," said Craig Lynch, accredited senior gemologist at Ouellet and Lynch. In an experiment, Lynch demonstrated what happens to a composite ruby when it's exposed to the chemicals that any jeweler would use to repair or reset a piece of jewelry. Two minutes in, the chemicals start to eat away at the glass. "If it was a regular ruby, nothing would happen. You could leave it in here for days, nothing would happen," Lynch added. An hour and a half later, even more damage. "You can see the degrading of the glass," Lynch said. It's not just jewelers' chemicals. Lemon juice or common household cleaners can also damage composite rubies. "They looked like beautiful red rubies," said Ron Nelson, who said he had never heard of glass composite rubies when he bought some from a TV auction channel. "I thought I was buying a high quality jewel that would last forever," he said. So what about the rubies "GMA" bought? We took them to the American Gemological Laboratories in New York. After microscopic and advanced analytical testing, Christopher Smith, president of the lab, said three of the four ruby rings "GMA" bought were composites. "We identified the presence of lead within the glass, which is conclusive proof of this material," Smith said. The three rings in question were from three different Macy's stores. Macy's declined to go on camera but said in a statement: "Ruby gemstones sold in settings in Macy's fine jewelry department are genuine. In general, rubies are heat treated to enhance their quality and appearance. Rubies also may be fracture-filled with a glasslike substance during the heating process to improve the overall quality of the stone. We have signs in our precious and semi-precious gemstone display cases to inform customers that gemstones may have been treated and may require special care. Rubies sold at Macy's are of excellent quality and represent an outstanding value for our customers." During our shopping trip, we were never told about the addition of glass to the stones. There was a disclosure sign that said precious and semi-precious stones may have been treated or enhanced by oiling, heating or irradiation, accepted techniques that have been around for decades. There was not one word about glass composites. "Each one has to be represented for what it is," Smith, of the American Gemological Laboratories, said. Matlins added: "Without this kind of disclosure, the consumer does not have any idea what they're buying." And no idea if they're getting a fair price, a practice that has some consumers seeing red. To make sure you know what you're buying, the best thing you can do is to ask if the gem has been treated, and how; if it contains glass; if it requires special care and whether the store accepts returns. Get the answers in writing and then verify what you've been told by taking your gem to an independent gemologist appraiser. If you didn't get what you paid for, take it back. For more information, go to the Accredited Gemologists Association, the Jeweler's Vigilance Committee, or to the American Gemological Laboratories.